A flavorful Indian-inspired chicken dish, marinated in a spiced yogurt sauce. 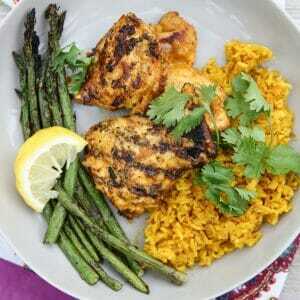 We suggest serving with our Indian Turmeric Rice. Rinse chicken thighs in cool water and pat dry with paper towels. Trim off excess fat, if necessary (a pair of kitchen shears is the easiest way to do this!) and place in a glass bowl or heavy duty zip-top bag. Place yogurt, lemon zest and juice, garlic, onion, olive oil, salt, black pepper, paprika, cumin, ginger, turmeric, and red pepper in the blender and process until smooth. Pour over chicken, toss to coat, and marinate for 24 hours for best results. Preheat grill to medium heat and oil grill grates to avoid sticking. remove chicken pieces from bag or bowl and allow excess marinade to drip off. Place chicken on grill and close lid. Cook for 4-6 minutes on each side or until chicken reaches an internal temperature of 165 degrees F. Chicken can also be cooked in a skillet, indoor grill pan, or under the broiler. We suggest serving with Indian Turmeric Rice and a veggie of your choice. Feel free to omit the ground red pepper if you want no trace of heat, or add more if you’d like a little kick to it.